InvestoRegulation is a leading specialist provider of financial services conferences and continuous development education in the UK and Asia. We run a range of events, exploring current developments, recent legislation and key issues in securities regulation and the international capital markets. InvestoRegulation has built a reputation for delivering the very best in specialist financial services education. Through our world-beating programme of conferences and workshops we have helped thousands of professionals stay ahead of the legislative changes and regulatory issues that impact anyone dealing with complex financial transactions. 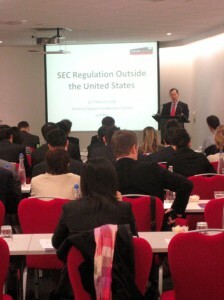 Our internationally recognised conference series SEC Regulation Outside the United States – now in it’s 17th year attracts lawyers and financial services professionals. Complemented by our full range of customised seminars, workshops and consultancy in allied areas for senior management and CEOs and a comprehensive CPD accreditation, it is easy to see why we provide the must-attend evens in this sector. We ensure that our programme writers and speakers are individuals at the very forefront of international securities regulations, so you can be confident that you are getting the very best information and advice. Complementing our conferences, we offer a full range of customised seminars, workshops and consultancy in allied areas for senior management and CEOs, as well as tailor made workshops for law firms and other professional practices. The pace at which the U.S. Securities and Exchange Commission (SEC) continues to update and adopt new rules and policies shows no signs of changing as we move into 2015. Already the organisation has published details of its examination priorities for this year via the Office of Compliance Inspections and Examinations (OCIE) with the priorities reflecting the practices and products that they perceive to present potential heightened risk to investors and/or the integrity of the U.S. Capital markets. For individuals working in the financial markets or allied services, keeping up with the legislation and identifying how it impacts their daily practice is essential. How do you ensure that you are ompliant, or can identify the risk factors within your own organisation. Are you fully aware of the SEC’s thoughts on Fee Selection and Reverse Churning, Fixed Income Investment Companies or potential equity order routing conflicts? SEC Regulation Outside the U.S. is a series of conference and workshops especially designed for professionals who need to understand the complexities and nuances of the legislative processes and how SEC practices can affect your business. © 2019 Investoregulation. All Rights Reserved.